Scoliosis is a condition in which your spine is curved sideways. Your spine may appear to be more “S”- shaped rather than a straight line. Around 8% of people over 25 will have a scoliotic curvature in the spine. This rises to 68% in people over 65 and about 10% of these are severe. How Is the Condition Named? A scoliosis is often named depending on where the apex of the spine curvature occurs. These curves usually occur in the thoracolumbar (junction between your thoracic and lumbar) and thoracic (mid-back) areas of your spine. It is uncommon for the condition to occur in the neck. When Should You Screen Your Spine? The best time to screen the spine for the condition is early adolescence, especially from 11 to 14 years of age. If not treated during adolescence, this medical condition can progress during adulthood. Therefore, getting checked and receiving treatment at an early stage can significantly improve your muscular strength, comfort and mobility. • One shoulder or hip higher than the other. • Having trouble with deep breathing. • Tightness and soreness along your spine. • S-shaped curve when your spine is viewed from behind. Contrary to common belief, the condition doesn’t result from poor posture. It can, however, progress to a curve that’s more severe due to a poor posture of your weak spinal muscles. Checking for this medical condition is undertaken by your physiotherapist during a routine clinical examination. Your physiotherapist is going to examine your feet, legs, spine, pelvis, rib cage and shoulders for any abnormalities and asymmetry. If your physiotherapist suspects you have the condition, they’ll arrange for X-rays or EOS scan so that they can confirm the severity of the condition or your Cobb angle. 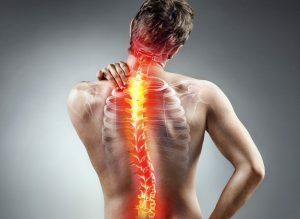 The many causes of this condition include neuromuscular problems, spinal deformities and inherited conditions or diseases caused by the environment. About 65% of the cases are idiopathic, around 15% congenital, while about 10% are secondary to neuromuscular disease. • Soft tissue release to relax the muscles in a tightened position. • Joint mobilisation and manipulation, which may loosen up your compressed and tight joints. • Creating an exercise program that will assist with pain management. • Providing a postural assessment. As the pain and inflammation settle, your physiotherapist will concentrate on optimising your muscle strength and flexibility on either side of the condition. Also, they will include adjacent areas like your shoulder and hip region that might have an impact on your spinal alignment. Generally, the aims of the main treatment will include restoring your normal ROM, core stability, muscle length and resting tension, endurance and muscle strength. Taping techniques can be applied until adequate flexibility and strength in the muscles that are targeted has been achieved. This treatment is geared toward making sure you return to your normal daily activities, such as recreational activities and sports, without re-aggravating the symptoms you had. Depending on your chosen activities of daily living, sport or work, your physiotherapist will aim at restoring your function to safely enable you to resume your desired activities.